Summer is a great time to catch up on classes you've missed or get ahead and graduate early. Summer at WSU offers the flexibility you need to fit your educational goals into your summer plans. Registration* for Summer Session begins Monday, Nov. 5. WSU students will be able to register for summer when their spring registration windows open. 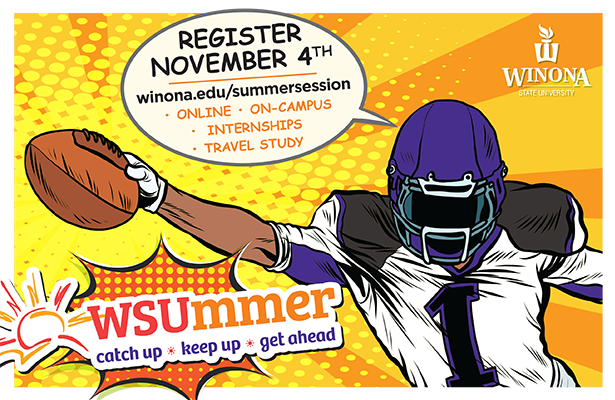 Visiting and Guest students will be able to register for summer starting at 8am Monday, Nov. 12. *If you are not a current WSU student, please review this important admission information. WSU offers a variety of online, on-campus and hybrid courses as well as faculty-led travel programs and internship opportunities to keep you progressing toward your academic goals. Learn more about how current students, visiting students and non-degree seeking individuals can benefit from Summer Session at WSU. A variety of summer housing options are available to students staying in Winona over the summer. On-campus housing is convenient and affordable. Off-campus options can also be found in the summer for short-term or long-term leasing. Most on-campus parking is free over the summer, refer to the 'Summer Parking Information' in the WSU Parking Regulations for details about summer parking. Summer employment is easy to find for WSU students. Check out Warrior Jobs for employment opportunities on and off campus. Internships are a great way to earn college credit and possibly some money at the same time. Talk with your academic advisor about the internship process and possible internship sites. Enjoy lakes, bluffs, trails, festivals, art, music, culture, and so much more in the Winona and Rochester areas during the summer. Check out our Summer Fun page to start your summer adventure. Please know that while many classes fall into the standard three Summer Session terms, there are some courses that will run the full summer session (May 11 - Aug. 7) and some that will start and end outside of the standard sessions. Please be sure to check the dates listed on your schedule in your Student eServices account once you have registered for your summer classes. It is important to note that a Summer Session course is equivalent in its content and learning outcomes as the same course offered during the fall or spring semester. Students may register for up to 19 credits for the entire summer term, but are strongly advised to not enroll in more than two (2) courses or six (6) credits in any one summer session. Should a student enroll in more than two (2) courses or six (6) credits for May Session, the University will contact the student to discuss if it is reasonable and appropriate.